Ever since I was a teenager I have always said “I will never get any dog that has Border Collie mixed in, they are way too high strung." Then, I met my sweet Dexter, who I didn’t know was mixed with Border Collie until I had already fallen in love. My job from that day on was to keep him busy – and he knew it. We started Bell Training for potty breaks. After he had mastered that skill, he learned to use the bell when he was hungry or when he was bored! Dexter is happy doing literally anything - ball, frisbee, running, walking, playing with other dogs, & swimming. You name it; Dexter wants to do it! My dog’s energy changed my life. I started hiking with him any time I had free. I decided to move away from the beaches of North Carolina, because it was too hot for him, and we had to travel far to adventure. I started getting up earlier and exercising more to keep up with him. The second I grab my keys and look at him or put on my hiking boots, Dexter takes me to the door because he knows it’s adventure time! Although I did my job before and after work, about 2 months ago I started feeling so guilty; that even though he had free run of the whole house, he would just sleep all day when I’m at work. The poor guy has so much energy! So, I did what we were both ready for; I got my dog a dog. Now, Denver is a purebred Australian Shepherd and is the complete opposite of what Dexter was as a puppy, except that she has even more energy. I’m constantly chasing her, watching her, taking things out of her mouth, making sure she stops herding all her dog friends and kids, snuggling her, getting up late with her, the list goes on. Knowing that Dexter was the perfect puppy, I knew you can only have one perfect dog and I was prepared for Denver to be a handful, but I don’t think a lot of people realize how much work a puppy is! 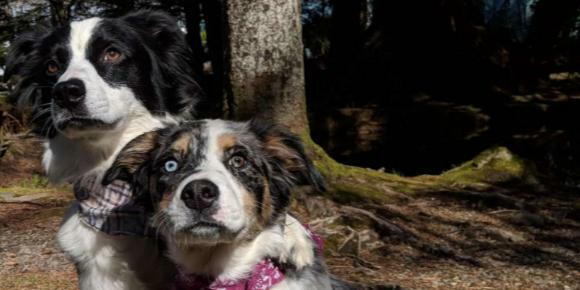 Let alone a herding dog, let alone two! Double the dog = double the energy! But, I wake up every morning by dog-piles and doggy kisses. I set out on adventure more, and step out of my comfort zone more finding new and creative ways to entertain my dogs. I laugh at their goofy nature constantly and I talk to more strangers about our goofy companions. I’ve never felt such unconditional love, loyalty and determination as I have with these two. Every day that Dexter herds me to Denver’s kennel to get her out to play with him with his big goofy smile I know that through the tired, endless work of raising high-energy dogs, it was, and always will be worth it. Now that the ice is melting, we are going to start working on agility and going on runs again, so if you see a tiny 5’0 girl and two crazy dogs be sure to give us a wave!